Construction on Calgary's Airport Trail could start as early as September of this year, after council approved $38.15 million in funds Thursday for the $153.35-million project. 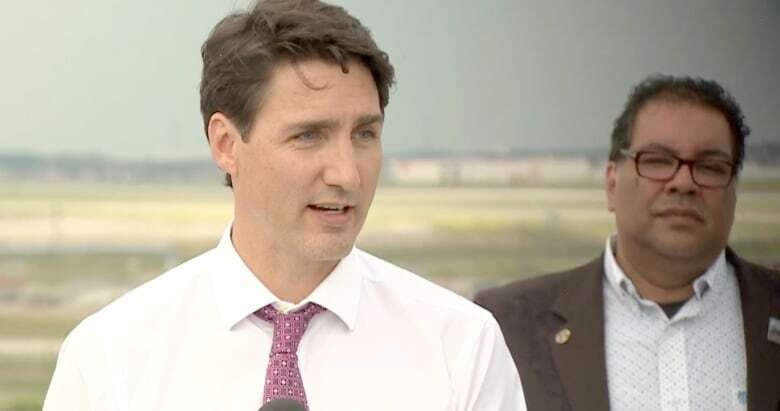 Prime Minister Justin Trudeau announced $50 million in federal funding for the major roadway — with the goal of creating a new east-west transportation link for Calgary — earlier this month. Alberta is contributing $27.7 million and another $20 million is coming from the Calgary Airport Authority. The remainder of the project's budget will depend on the cost to the city of purchasing land needed for two new interchanges at Barlow Trail and 19th Street N.E. That amount also includes some room for overages built into the project's total estimated cost. "As it stands now, there is a portion that is unfunded," said Coun. Shane Keating. The Calgary Airport Authority said it was committed to splitting the cost of the land acquisition with the city in addition to the $20 million. Keating said the decision of the federal and provincial governments to fund the project helped convince the city it was time to move ahead. "When the opportunity knocks and you see that there's the future potential savings and future potential growth, which ends up giving you more revenue, then you should shuffle the deck and reorganize things and I think that's what we did," he said. The project will see a new segment of road built between 36th Street and 60th Street N.E., with an intersection at Métis Trail. It will also include the first stage of an interchange at 19th Street and Airport Trail, along with a new, southbound-to-westbound ramp at Stoney Trail and Airport Trail. It's the second phase of the Airport Trail expansion project, following the opening of the 620-metre, six-lane Airport Trail tunnel in 2014. Keating said the city may have jumped the queue a bit by building the tunnel before the rest of the trail, but he said it paid off in future savings. "What we've got now is a true connection, open on Stoney Trail straight through the airport all the way to Deerfoot. And the land in between can be open for greater potential which gives the city more revenue," Keating said. There is an allocation for public art in the project's budget but, as the city's public art project is on hold, no plan has yet to be developed for what that art might be. An estimated 406 construction jobs will be created to get the expansion built. All work on the project is set to be completed by the end of 2022.